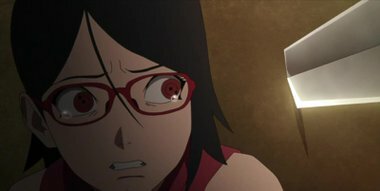 Sarada arrives at the tower where her father is, only to be hurt by Sasuke's surprising words and actions. Naruto and Cho-Cho can hardly bear to watch the awkward exchange between father and daughter, and try to think of something to help. But the party is attacked by a father-son duo who call themselves "Shin Uchiha," and who possess the Sharingan! Meanwhile, Sakura learns that Sarada has gone to meet her father.